Though it was nearly a dozen years ago that we were introduced to this wonderful family in Becca at Sea, only a few years has gone by on the island and 11-year-old Becca is staying with her grandmother, aunt, cousins and other assorted characters. In this moving novel for middle-grade readers, Baker shows us the beauty and occasional brutality in nature, how to see beyond a person's outer mask, the consequences of rash behavior, and the importance of caring family and friends. And Shakespeare's The Tempest is staged! 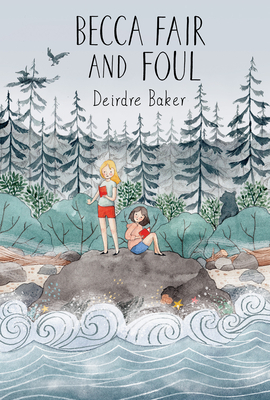 When eleven-year-old Becca returns to her grandmother's rustic cottage for another summer, she finds herself seeing her beloved island in new ways. A hunting owl mistakes a bobbing ponytail for prey. A cozy sleepover on the beach takes on the tinges of a nightmare when a family of river otters shows up to claim their territory. An argument between a nestbound baby eaglet and its haranguing mother reaches operatic dimensions. Becca finds a dead bear on the beach and helps to give it a burial at sea. Then there are dramas of the human variety. Aunt Meg is grieving over a miscarriage, and Aunt Clare's medical work in Africa has brought on a sadness that even the love of family and the island's beauty can't cure. And there is the burning question of whether Aunt Fifi and the local plumber will ever become an item, and would that mean losing the only plumber on the island? Meanwhile, cousin Alicia claims to be too old to participate in the kids' summer project -- a performance of The Tempest, a play that seems to find unsettling echoes in the natural surroundings Becca thought she knew so well.